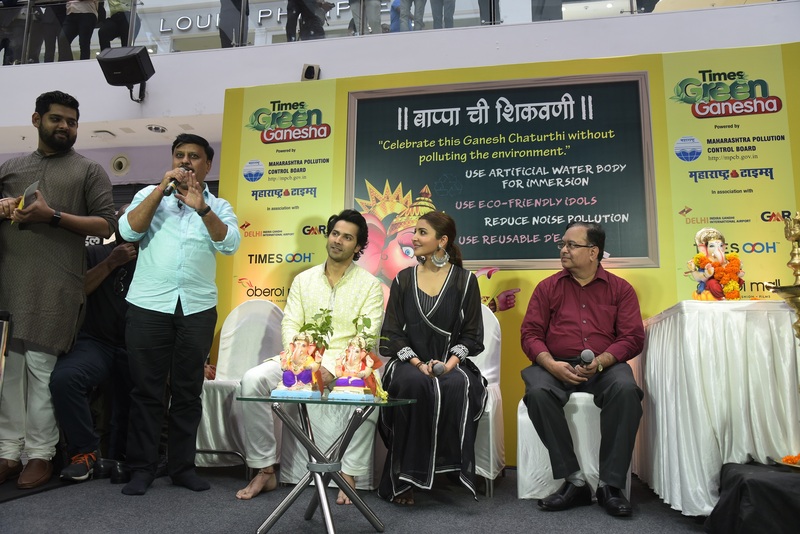 Mumbai, 11th September 2018: Taking its passion for green initiatives a step further, Oberoi Mall, one of the trendiest shopping destinations in Mumbai, set the tone for eco-friendly Ganpati festivities this year, by hosting Bollywood superstars Anushka Sharma and Varun Dhawan to launch the Times ‘Green Ganesha’ campaign. Being a LEED-certified mall, Oberoi Mall has always been a pioneer of sustainable options and inspiring environment friendly idols for the auspicious occasion of Ganesh Utsav is another move in this direction. Supporting this praise-worthy initiative, B-town favourites Anushka Sharma and Varun Dhawan arrived to a thunderous applause from the crowd and enthralled their fans with their camaraderie. Engaging with the teeming crowd, both Anushka and Varun, explained the importance and benefits of celebrating the festival in an eco-friendly manner. Known for his cheerful banter, Varun Dhawan called out to the audience to enjoy the festivities responsibly, while the ever-joyful Anushka encouraged the youth to maintain discipline while festival proceedings were conducted smoothly. Cries of ‘Morya’ echoed in the atrium following the duo’s chant of ‘Ganpati Bappa’. Post the event, an idol-making workshop was also conducted for children between the ages of 5-10 years. More than 100 children participated in the workshop and learnt the art of making eco-friendly Ganesha idols. They were educated about the necessity of producing idols organically to support a greener and healthier planet. Over the years, Oberoi Mall has attracted significant attention for such novel and community-friendly initiatives displaying far-reaching results. The ‘Green Ganesha’ project, ably supported by popular megastars Anushka Sharma and Varun Dhawan, adds more power to their credentials. The Oberoi Mall is located at Goregaon (East) on the Western Express Highway and offers almost 5.52 lakh square feet of Fun, Food, Fashion and Films. It has occupied a significant position in the minds of customers and retailers. By reflecting and enabling customers’ lifestyles and delivering affordable luxury with a philosophy of ‘customer first’, the Mall has distinguished itself as something truly special on the retail landscape. Pioneered by the real estate development company, Oberoi Realty Ltd. (popularly known as Oberoi Constructions) Oberoi Mall has found a unique niche amongst quality conscious and discerning customers and offers facilities that include two levels of basement with a parking capacity for approximately 1,000 cars, a large central atrium with natural light, elevators and escalators for internal circulation, central air-conditioning and an integrated building management system.